Hokusai has long been my favorite Japanese artist. But for a long time I hadn't looked at his work. 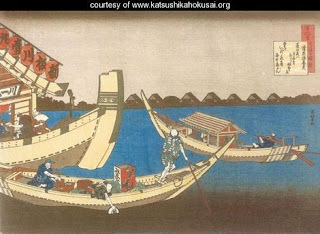 Recently, some new Hokusai books were published and I realized that quite a few of Hokusai's wood cuts had boats in them. By western standards, the boats all look curious, square sterned and high bowed. 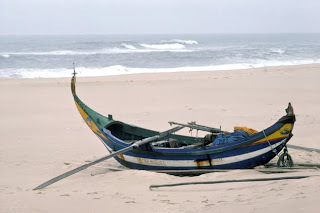 But they do resemble Portuguese surf boats to some extent. Portuguese had a lot of places where harbors were missing and fishermen had to launch through the surf. As a result, the boats had high bows that would keep the surf from swamping the boats. Japanese boats apparently had similar conditions to contend with. Makes me want to build some skin on frame small scale surf boats. The other curious thing about the Japanese boats is the dotted lines along the edges of the planks. Were these boats sewn together like some Polynesian boats? Looks rather like the Point Hope kayak, or the King Island type but bigger. Certainly the King Island kayaks were launched into big seas and I would guess the Point Hope type would have been used close to shore in surf.